A 2015 survey of US household energy use and energy insecurity conducted by the Energy Information Agency shows several disturbing trends. Data was not available for Philadelphia specifically, so PEA took a deep dive into the Residential Energy Consumption Survey data to better understand how energy insecurity affects urban households in the Mid-Atlantic region. PEA’s research found that nearly one quarter of Mid-Atlantic urban households faced energy insecurity for at least a portion of the year. Energy insecurity means that a household has received a utility shut-off notice for failure to pay bills, has foregone some basic necessity like food or medicine in order to pay utility bills, or opted to keep their home at an unhealthy temperature in order to reduce energy bills. This overall rate of energy insecurity is extremely high, but PEA found that the rate of insecurity was even higher for certain populations. The most glaring example is that more than half of all African American households reported facing energy insecurity for some part of the year compared to less than 20% of white households. Over 30% of renters, over 35% of households with children, and over 40% of households earning less than $20,000 per year also reported facing energy insecurity. Energy insecurity is a prominent challenge in Philadelphia that PEA is working to tackle through our programs. PEA is committed to helping all Philadelphians reduce their energy burdens and is especially focused on low-income households. PEA is working with the Philadelphia Housing Development Corporation and the Philadelphia Redevelopment Authority to include energy efficiency and health standards in their programs that are helping low-income homeowners improve their homes. PEA is also piloting a program designed to save energy in multi-family low-income buildings. Through the Solarize Philly program, PEA is making solar power available to homeowners who wouldn’t normally be able to pay for or finance a rooftop solar PV system. PEA requires that all of its partners hire locally and from a diverse workforce and we are developing education and training programs with the School District of Philadelphia and other partners to make sure that all Philadelphians have access to the opportunities that come from the clean energy economy. The U.S. Energy Information Agency (EIA) administers the Residential Energy Consumption Survey to “a nationally representative sample of housing units.” The survey was conducted in 2015 and captures a cross-section of American households (both owners and renters), characteristics of their homes, and energy consumption factors. Chip Berry, who manages the Residential Energy Consumption Survey at EIA explained that the survey was not designed to allow for very detailed local analysis; however, it is possible to make assertions about regional trends.1 The survey also breaks down trends based on the U.S. Census’s urban classification, allowing a more focused look at urban households within a region. Using the microdata available on the EIA’s website,2 PEA analyzed the trends in energy burdens on urban households located in the Mid-Atlantic region. EIA cautioned that this is the smallest geographical scale that is appropriate for making inferences from the Residential Energy Consumption Survey data. Many of PEA’s findings paralleled the findings from EIA nationally. In its analysis, the EIA found that nearly one in three U.S. households faced energy insecurity.3 PEA broke this analysis down for urban households in the Mid-Atlantic region, which encapsulates the City of Philadelphia. Households facing energy insecurity may have received a utility disconnect notice, have kept their household at an unhealthy temperature, or have foregone basic necessities in order to pay their energy bills. The seriousness of this problem is evident by looking at how frequently urban households are burdened by it. Most people are choosing the financial trade-offs of maintaining an unhealthy temperature in their home or sacrificing basic needs to pay energy bills for several months of the year. 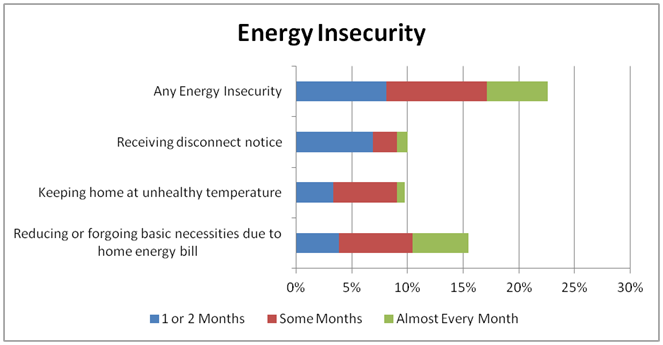 Energy insecurity is an ongoing issue for these households throughout the year, not a one-time problem. It is extremely concerning that nearly one in four households put their health at risk to pay their energy bills or they are simply failing to pay those bills and are being disconnected from their utilities. According to the REC Survey data, energy insecurity is an issue for households across all income levels, but it disproportionately affects low income households. Over 35% of households earning between $20,000 and $60,000 per year faced energy insecurity at least some point during the year. For households earning less than $20,000 per year, the figure jumps to 40%. These findings are discouraging and provide further evidence that paying for energy is a serious challenge within low-income urban communities. The American Council for an Energy Efficient Economy (ACEEE), in their report titled “Lifting the High Energy Burden in America’s Largest Cities” has likewise found that energy bills create a disproportionate energy burden on low-income households.4 ACEEE found that low-income households (those earning less than 80% of area median income) spent a median of 7% of the family’s earnings on utility bills. Figure 2: Energy Insecurity for households in the Mid-Atlantic region by demographic characteristics. The data illustrates several other important trends. 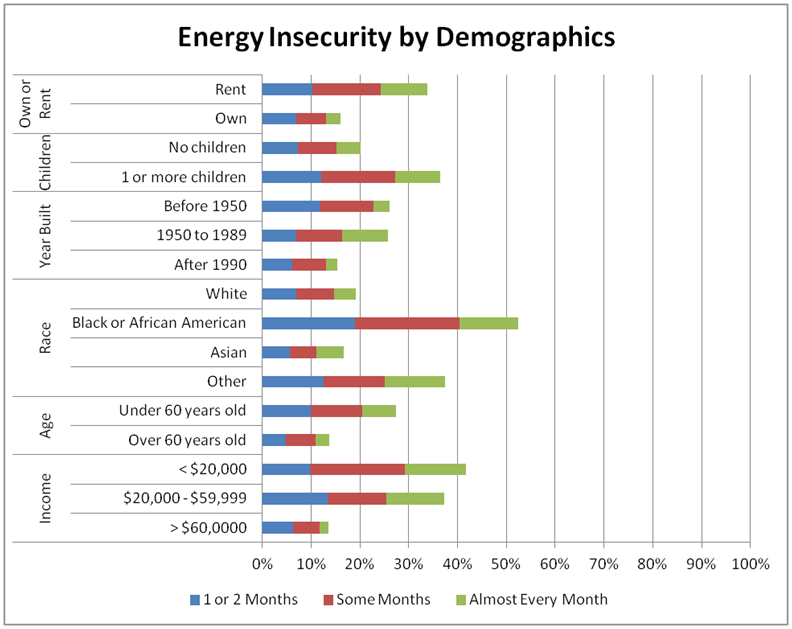 Over half of all Blacks/African Americans and 30% of all renters face energy insecurity for some portion of the year. Further, over one third of households with children face some degree of energy insecurity. These shocking numbers demonstrate how much of a burden energy insecurity is on urban communities, especially low-income and African American households, households with children, and renters. These communities are required to sacrifice certain basic necessities or keep their household at an unhealthy temperature in order to pay these overwhelming energy bills. Not only is the number of people who are affected alarming, but the extent to which they are being affected is of great concern. Philadelphia needs to act to prevent people from foregoing basic necessities and living in unhealthy conditions. The same households that face the highest levels of energy insecurity – renters, low earners, and minorities – are also users of utility assistance programs and are often living in poor quality, unhealthy housing. Concentrating our resources in energy efficiency and interior health measures in the form of weatherization, equipment replacement, and other interventions would reduce energy insecurity and vastly improve the quality of life of our most vulnerable citizens. Email correspondence, November 27, 2017.